All Labor – ONE (1) year. All Materials – FIVE (5) years. All Materials – THREE (3) years. This warranty is voided if the rolling shutters are installed or repaired by anyone other than an authorized ROLL-A-SHIELD agent. This warranty is also voided if the shutter slats are painted. Our obligation under this warranty is limited to the repair or replacement of any part which, upon our examination, is found to be defective. This warranty does NOT cover parts or materials which have been subjected to accident, negligence, alterations, abuse, misuse, excessive wear and tear, or acts of God. This warranty is in lieu of all other warranties, including implied warranties of merchantability and fitness for a particular purpose. There are no warranties which extend beyond the description herein. Congratulations, you have purchased the finest rolling shutter available anywhere in the country. We not only utilize the finest materials, but provide the most precise workmanship in fabricating each custom-made shutter. We suggest that you take a few minutes to look over the following information pertaining to maintenance, cleaning, and trouble shooting. This will help you to have years of trouble free service from your ROLL-A-SHIELDs. Your ROLL-A-SHIELDs are virtually maintenance free. However, a few minutes of attention will keep them operating smoothly for years. Once a year, or as needed, put the shutter in the completely closed position and hose it off with a garden hose. If stubborn dirt has been deposited on the shutter, you can use a dilute solution of a very mild soap to clean off the dirt. This should be followed by a thorough rinse with water. DO NOT use harsh household cleaners on the shutters since this will damage the painted surface. Caution, never raise a manually operated shutter so quickly that it slams into the housing at the top of the unit. 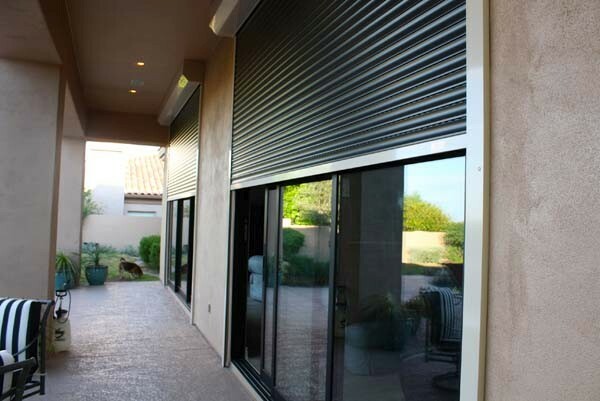 This can damage the entry guides and other internal parts, thereby requiring a service call to repair the shutter. If your ROLL-A-SHIELD fails to operate properly, DO NOT force the operation as this could cause unnecessary damage to the slats. First, check the trouble shooting guide for a possible solution. If the problem cannot be resolved, please call us for suggestions or to schedule a service call. Many service calls are unnecessary and the problem can often be solved by the owner. If a service person is sent to your home, we will charge a service call fee. PROBLEM: Manual unit is stuck in the open position and will not come down. POSSIBLE SOLUTION: The unit may have been opened with too much force. Loosen the strap inside, then go outside and pull down gently on the bottom slat, keeping the bottom slat inside the tracks. PROBLEM: Manual shutter sticks as unit travels up or down. PROBLEM: Crank will not roll shutter up. POSSIBLE SOLUTION: Follow the directional arrows on the crank box. If cranking in the wrong direction, you will hear “click, click, click”. If so, gently pull the strap up and out of the crank box, and while holding the strap, turn the crank in the direction of the up arrow until the strap starts to roll into the box. Roll all the excess strap back into the box, then continue to crank in the up direction. PROBLEM: Electric unit will not move up or down and no motor noise is heard. POSSIBLE SOLUTION: Excessive usage over a short period of time causes the motor to overheat. The motor will shut off automatically. Wait 15 – 20 minutes. The motor should work. Check your power source to be sure electricity is getting to the unit. Check your fuse box or breakers, and also check the GFI outlet re-set button in your bathroom, kitchen, or garage. PROBLEM: Electric unit hits an obstacle while closing. SOLUTION: TURN UNIT OFF IMMEDIATELY. If caught quickly there may be no damage. Go outside, remove the obstacle, and pull down gently on the bottom slat. To download and print a copy of our Warranty. Click Here.